If you have a passion for finance and like the idea of being paid for your knowledge, a career as a finance writer could be for you. But before specializing, you’ll need to be flexible and willing enough to write on any subject within your chosen niche, at least when starting out. Another important aspect of being a successful financial writer is coming across as knowing what you’re talking about. Your own knowledge is one thing, but you’ll also need to draw upon the knowledge of others, i.e. utilizing available resources. Two key categories of information are websites and apps. Let’s look at some of the most useful sources from within those categories. IG is a trading platform and source of financial data for writers within the financial trading niche. It features live prices from more than 15,000 markets, including the FTSE 100 and Wall Street. It even has a trading academy, which, if you really are interested in writing about this market, could help you further increase your knowledge on the subject. IG is a particularly useful resource if you’re writing about a certain part of the world, thanks to its numerous country-specific pages, such as its UAE page. It’s important to know about the financial climates in countries with influence far-reaching; if you’re writing about finance in the UAE, for example, you would need to know about its booming oil industry and its impact upon economies all over the world. According to Statista, last year’s oil production in the UAE produced somewhere in the region of 3.94 million barrels of oil per day. XE focuses on currency services. Both traders and investors use the website to find out currency analysis, news, and real-time quotes. The site also provides currency converters, as well as a number of currency calculators. Users have the opportunity to sign up to daily updates with news headlines, central bank interest rates, and currency rates. XE posts numerous updates on social media and users can also download XE’s currency apps for iPhone, iPad, Android, Windows, and Blackberry phones. 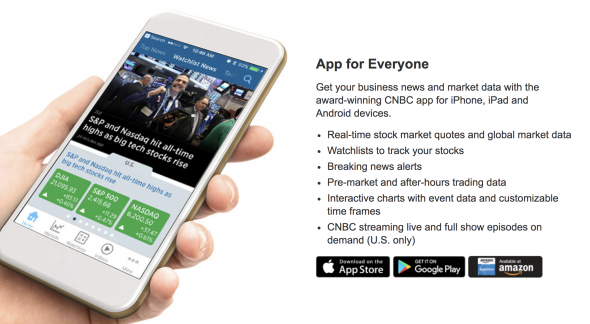 NBC’s flagship financial news app, CNBC Business News and Financial App, provides access to market data, financial information, and business news to give you the bigger picture. The app updates you with breaking news that is pushed through even when the app is closed. It also allows you to keep an eye on real-time stock quotes, and even watch episodes of such shows as American Greed and Mad Money. TheStreet began as purely an informational website but is now available in app form for both Android and iPhone. The app enables access to financial news and analysis, as well as expert stock-picking tips. The app also provides market news, technical analyses, actionable data, and commentaries and opinions. It further delivers detailed stock analysis and quotes and supplies a proprietary stock model rating model it calls TheStreet Ratings. 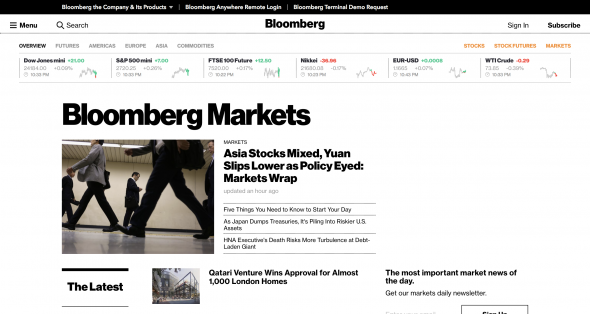 Bloomberg is a great resource for when you need to quote numbers in your writing, as well as being one of the more prestigious names in the industry. Its website is full of information and charts for you to draw from. You can see a snapshot of the markets at the top of the page that shows data from the U.S., Asian, and European markets. You can also access indexes from the Americas, Asia-Pacific, the Middle East, Africa, and European markets. Then there’s data for certain currencies, bonds, commodities, and futures. By choosing “Economic Calendar” under “Market Data”, you can view present and future economic announcements, including the EIA Petroleum Status Report. The site also provides historical price shares and delayed price quotes. The Fox Business app enables you to stay connected to the continually evolving business world. It also sends financial alerts and tracks financial markets. If you choose, you can create watch lists simply by adding stocks to the My Stocks page, as well as search for stocks by their ticker symbol. There’s also the option to access up-to-the-minute market data and news through Fox’s business broadcasts, as well as view clips from a selection of shows on the Fox Business Network. If you’re brand new to freelance writing, you may find it difficult to specialize in finance to begin with. As you build up your portfolio on that topic, however, you’ll be able to leverage it for more work on what you’re really passionate about.